Both the MOSSAR & KSSSAR Color Guard Teams presented the National Colors on Saturday, July 18, 2009, at the World Team Tennis Tournament in Kansas City, Missouri. 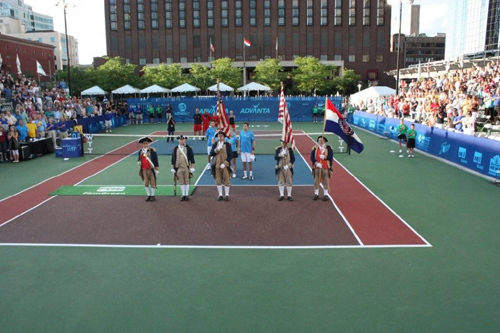 The Tournament was held at Barney Allis Plaza where the Explorers vs. Washington Kastles played in front of an audience of over 1,200 people. The Explorers closed their home season on July 18th as the No. 1 men’s doubles team in the world, Bob and Mike Bryan, joined the team for their fifth season. Photo: (L-R) Major General Robert L. Grover, MOSSAR Color Guard Commander; Compatriot Kyle L. Kesler; Compatriot Dewey Fry; Major General Fred Kaffenberger and Captain James L. Scott. Major General Fred Kaffenberger, Compatriot Dewey Fry and Compatriot Kyle L. Kesler are from the Delaware Crossing Chapter of Kansas.